What could possibly be wrong with having an optimistic outlook on life? Surely positive feelings are always better than negative ones? Not necessarily, says the journalist Barbara Ehrenreich, the author of the excellent Nickel and Dimed, whose new book Smile or Die I’ve been reading over the weekend. Not if it also means ignoring reality and abandoning critical thinking. Conventional wisdom in the US may demand that Americans remain vigilantly upbeat – in the words of the old Bing Crosby song, that they ‘accentuate the positive’ and ‘eliminate the negative’ – but as Ehrenreich’s investigation of the phenomenal growth of the multi-million dollar US “positive thinking” industry argues, the same conventional wisdom is deeply conservative, profoundly self-absorbed and stifles realistic warnings about risk, often with calamitous consequences. Indeed, the message of the torrent of self-help books, life coaches, ‘prosperity gospel’ churches and motivational speakers may have been an important contributory factor in the global economic crisis triggered by the collapse of America’s sub-prime housing market in 2008. Ehrenreich critique of “positive thinking” begins with the diagnosis of breast cancer she received ten years ago. Searching for information about the disease, she discovered “very little anger, no mention of the possible environmental causes and few comments about the fact that, in all but the more advanced, metastasized cases, it is the ‘treatments’, not the disease, that causes the immediate illness and pain.” Instead, “the cheerfulness of breast cancer culture goes beyond mere absence of anger to what looks, all too often, like a positive embrace of the disease” – an embrace where “dissent is a kind of treason”. Ehrenreich traces the roots of ‘positive thinking’ to a rejection of the harsh Protestantism of the nineteenth century and charts its rebirth in the growing consumer culture in the 1950s. However, its ideas have taken off as an industry in itself with the rise of neoliberalism in the 1980s and 1990s, where the notion that disease, poverty or unemployment are the essentially the result of personal ‘negativity’ is, of course, incredibly helpful to corporate America. This explains why companies often bulk-purchase copies of the self-help guides and DVDs to give to their staff, particularly to those who have either suffered or survived the latest round of redundancies. The message of the motivational ideologues is always good news, no matter how terrifying the circumstances: embrace ‘change’, see unemployment as an opportunity. What is fascinating about Ehrenreich’s argument, however, is how all encompassing this has become. The efforts of corporations offering consumer products and easy credit matched (and often overlapped with) the huge growth of mega churches, where a message that ‘God wants you to have a new house or car’ and would provide as long as people believed enough was a powerful incentive for the poorest to become woefully indebted. The emergence of ‘positive psychology’ provided pseudo-scientific foundation to the movement. With the quarterly share price becoming the only measure of corporate success, the same blind optimism amongst senior executives created a culture of complete denial at all levels of the possibility that bad things could happen, to the extent that anyone raising questions or expressing doubts faced the possibility of losing their job. There had, of course, been downturns before, like the dot com crash, but to even consider the possibility that house prices would collapse led to the firing in 2006 of Lehman Brothers’ Mike Gelband, the head of its real estate division. Within two years, as we now know, Lehman Brothers itself no longer existed. Even after the near collapse of the banking system, ‘positive thinking’ remains deeply embedded. The message has been so culturally ingrained that the motivational speakers have continued to make a fortune from the disaster and there are plenty who are prepared to condemn critics of the banks for ‘talking down the economy’ (and failing, presumably, to maintain sufficient ‘positivity’). Ehrenreich’s book argues that the alternative to positive thinking is not despair, but realism and critical consideration of risk, something that is clearly lacking in the growing reluctance in America to accept the evidence for the impact of climate change. The instinct to remain upbeat and deny that bad things may happen, this time on a global level, isn’t likely to disappear overnight. 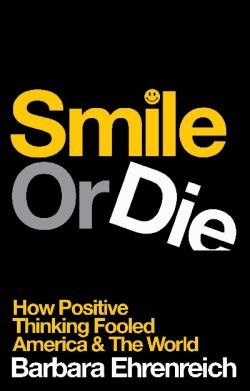 Brilliant though the book is, if I have one criticism of Smile or Die, it is the complete absence of arguably the most powerful motivational speaker of them all. Ehrenreich supported President Barack Obama’s election campaign, one built around a message of hope, change and individual responsibility that encouraged blind optimism (“Yes we can!”) in spite of the lack of any detail about how 'change' might actually be achieved. To have excluded him from a book that so thoroughly and accurately excoriates the Republican right seems like a deliberately partisan lack of critical thinking. Smile or Die: How Positive Thinking Fooled America & The World is published by Granta. Breast Cancer Action’s Think Before You Pink campaign raises concern about the number of pink ribbon products on the market and calls for more transparency and accountability by companies that take part in breast cancer fundraising. I read half of this book - in it's alter ego as Bright Sided - and it made me feel so depressed I couldn't finish it. It throughly smashes any point in 'positive thinking' - and even for a person who has never been accused of being an optimist it is unsettling. Not sure if smashing al notions of 'positive thinking' is completely good tbh, but if I ever get round to finishing the book I might have the answer. The links Ehrenreich makes to capitalism and materialism are brilliant. 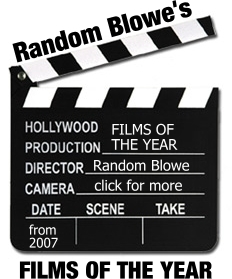 Definately not as readable as Nickel and Dimed or Bait and Switch. And I really dislike how this book has been published under two different titles and different covers which makes it look like they are different books. But I don't imagine for a minute that is down to Ehrenreich. I still think ignoring Obama completely is a real mistake though.